Main sources: Benson, Lyman, 1969, The Cacti of Arizona, Tucson: University of Arizona Press; Early, W.H., 1963, Cacti of the Southwest, Desert Botanical Garden of Arizona Science Bulletin No. 4; Phillips, Steven & Patricia Comus, eds., 2000, A Natural History of the Sonoran Desert, Tucson: Arizona-Sonora Desert Museum Press; Epple, Ann, 1995, A Field Guide to the Plants of Arizona, pp. 157-8, Lew Anne Publishing Co., Mesa AZ; Pizzetti, Mariella, 1985, Simon & Schuster's Guide to Cacti and Succulents, edited by Stanley Schuler, NY: Simon & Schuster. 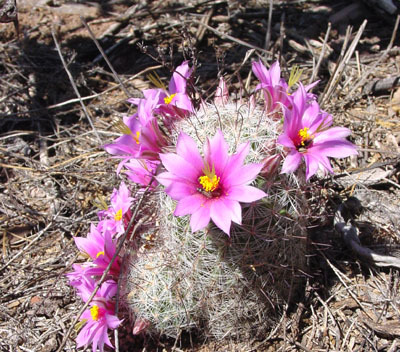 (For a very fine webpage illustrating rare Arizona cacti, see this link: Mineral Arts. All cacti are succulents -- plants which have adapted to restricted water supply by enlargement of stems for water storage and modification (or elimination) of leaves to minimize evaporation -- but not all succulents are cacti. Cacti are distinct from other plants in their "large, fleshy, usually leafless stems and by spines always (at least in juvenile stages) developed in clusters within spirally arranged areoles [sharply defined restricted areas on the stems]. This is not true of any other plants." 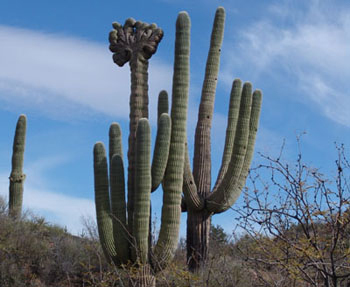 (Benson, p. 1) Below left, a single areole on a saguaro cactus. 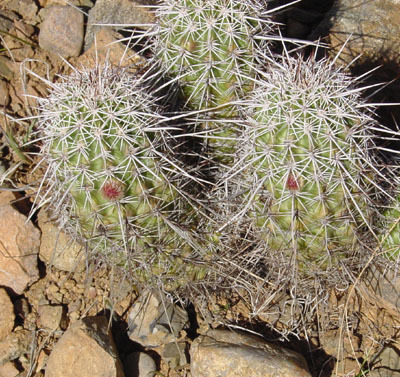 Cactus spines are (at least in juvenile stages) developed in clusters within spirally arranged areoles along the cactus stem, as is hinted in the array below right, several areoles and associated spine-clusters on a stem of a cholla cactus. 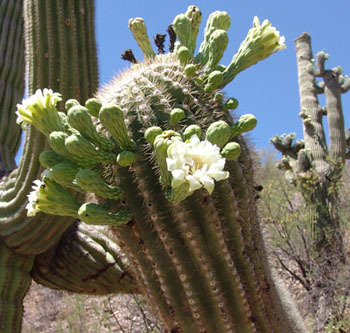 In some species, cacti develop small, ephemeral leaves, but most cacti have no leaves in the adult stage. Without leaves, all food production is done by the green cells of the stems, which are enlarged and have cells designed for water retention. Surfaces of the plants have waxy epidermal layers. 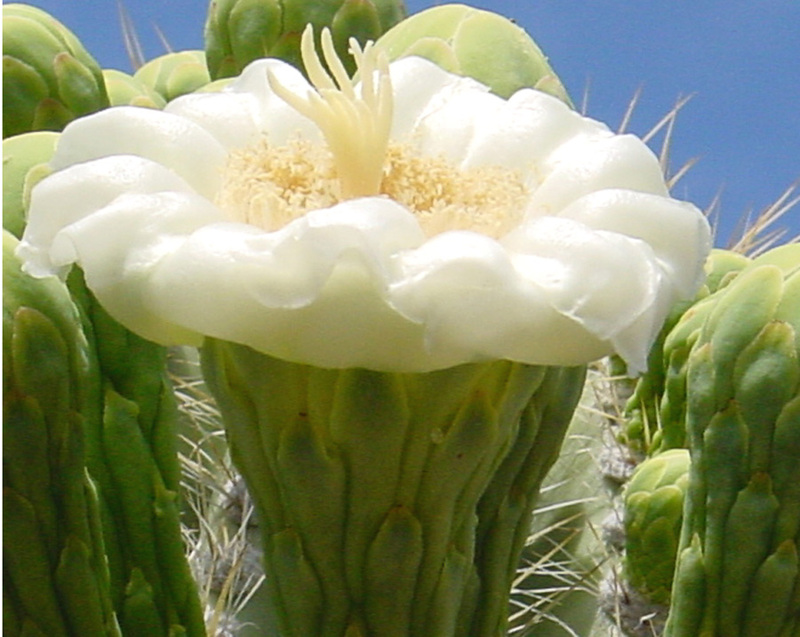 A few Cereus species cacti develop root tubers, but most have wide-spreading, slender but fleshy roots, well adapted to absorbing large amounts of water in brief periods of time. These cacti have stems with ridges and grooves on the surface. They are mostly large, and columnar, rather fast-growing, with large, nocturnally-opening white or reddish flowers -- which are produced within the spiny areoles or slighly below the apex of a branch. Fruits are large, oblong, and fairly hairless. 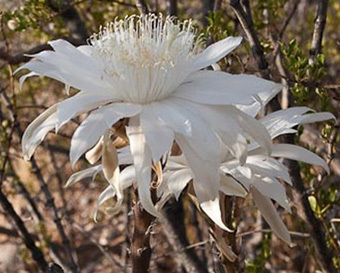 While the greatest variety of Cereus spp. are found in South America and the West Indies, in our immediate area two species are known to occur, but one is much rarer here than the other. 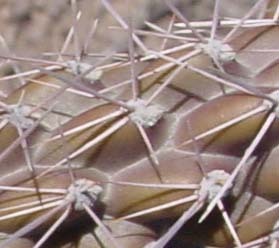 Stems of these cacti have ridges and grooves, but also sometimes separate tubercles on the surface. They range from globular to columnar in shape, are usually (but not always) unbranched. Spines include a central spine in the areole which is larger and often different in shape from all the other spines. Smaller, radial spines arise at the margins. 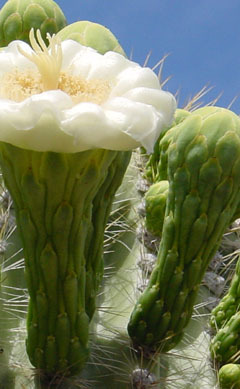 Flowers, produced at the stem apex, are short, stiff, and funnel-shaped, and the fruits are fleshy and scaly, become dry at maturity in most species and (in Echinocactus) hairy. Stems have ridges and grooves on the surface. 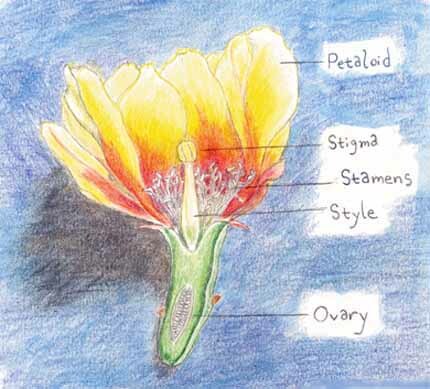 Flowers are produced below the stem-apex, each just above a mature spiny areole and bursting the epidermis of the stem as it grows. Fruit is spiny. Stems of Mammilaria have unconnnected tubercles on the surface. Flowers appear at the side of the stem, among older tubercles, having no surface conection with the areoles. Fruits lack hairs, scales, or spines. 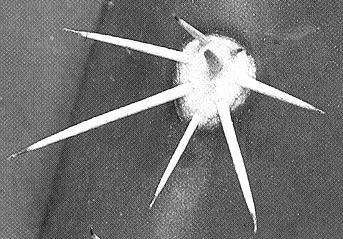 The stems of these cacti grow in jointed segments, and their areoles have, in addition to spines, glochids: numerous minute barbed bristles. 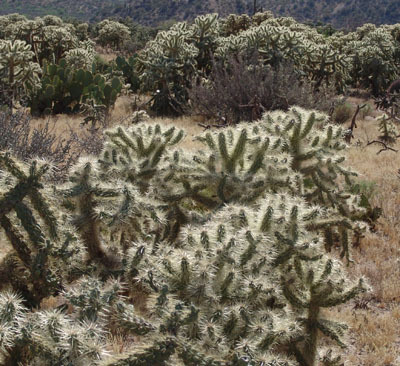 Glochids are not present in any other kind of cactus. 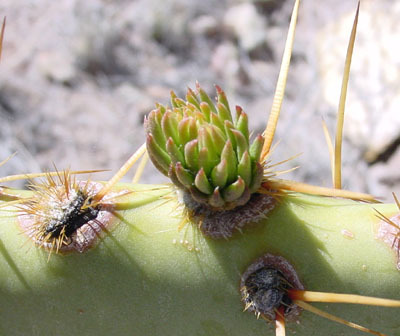 In the image at right, the glochids are the more numerous small bristles, the spines fewer and much larger. Glochids readily detach onto various body parts of passersby, and are so small they are often hard to see. The jointed segments typically (but not always) branch. Each new joint grows during the rainy season, beginning with buds which display tiny, ephemeral leaves (see at left), then filling out as a new segment, permanently ending with the onset of the dry season, and the next growth will occur as new joints branch from the areoles of the previous segments. 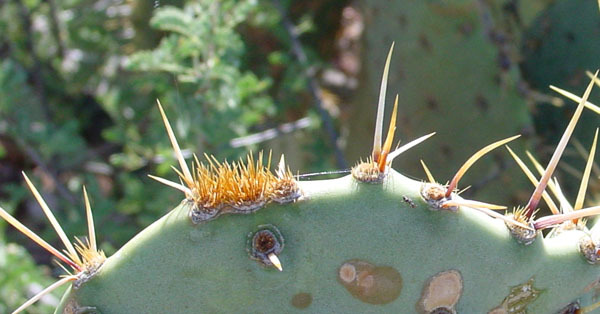 Shape of the branching joints distinguishes two major types of Opuntia: the "platyopuntias" (flat-stemmed) and the "cylindropuntias" (cylindrical-stemmed) -- in popular terms, the Prickly Pears and the Chollas.